In the early '90's Upper Deck utilized the brialliant analyst in an insert set titled Peter Gammons- Inside the Numbers, to provide commentary on the depicted player. All the big names of the era were included in the checklist. 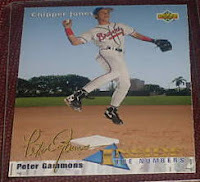 Fast forward several years and Donruss' Fan of the Game insert actually depicted Gammons on his own card. Today it was announced that after the MLB's annual Winter Meetings, that he will be leaving ESPN. I wish Peter all the best in his next venture which has not been reported but many are speculating will be with MLB Network. You can also find several, single signed baseballs and photos on eFee (eBay). The Fans of the Game card is one of my favorite Red Sox cards. I like Gammons a lot. Hope he ends up on MLB Network. Oh man. I don't mind Gammons leaving but like cardboardicons suggested, he HAS to go to the MLB Network. If he doesn't we will never see him again. Maybe MLB can fire Harold Reynolds and Billy Ripken. They seem to ignore stats. YES! He's headed to MLB Network. Christmas comes early! Peter G is one of the best of all time. A deserved HOF inductee.